Range of products with support structures of non-woven web manufactured either with Rando technology or traditional carding machine employing phenolic and acrylic resins as well as several kinds of minerals such as Aluminum Oxide, Silicum Carbide, Quartz and others. The wide range diversifies into several aggressiveness rates, weight and thickness. 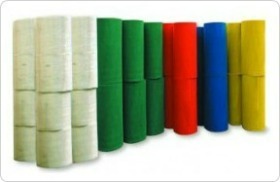 Available configurations: rolls (maximum size 2×75 m), wheels, sheets and pads. Special sizes upon request. The products availability in a wide range of colours enables the compliance with HACCP environmental cleanliness requirements. Standard colours: green, red, blue, yellow, black, white. Other colours available.